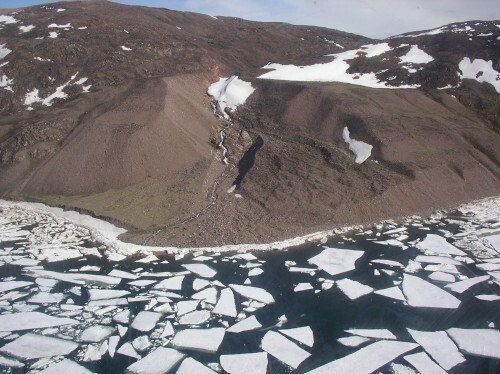 This summer a team of four scientists followed up on an exciting accidental discovery made during a 2006 expedition at Iita, a long-ago abandoned settlement in Greenland on the northern shore of the Foulke Fjord. The scientists were excavating artifacts left by the Arctic’s oldest inhabitants, the Paleoeskimos, who lived from about 4000 to 700 years ago. The five-week, U.S. National Science Foundation-funded study was led by archaeologist John Darwent (University of California, Davis), and included his colleague Hans Lange (Greenland’s National Museum and Archives) and graduate students Hans Lennert (University of Greenland) and Justin Junge (Portland State University). Archaeologists recognize Paleoeskimos as part of the Arctic Small Tool tradition meaning that (you guessed it) they made tiny tools out of chert/flint and quartz. The signature Paleoeskimo artifact - microblades, small blades that enabled them to maximize cutting edge – were customized to the Paleoeskimo lifestyle. During the excavation, Darwent’s team opened up nine 1 x 1 meter plots. They removed the sod layer then used trowels to scrape off 10 cm of dirt at a time. This allowed the team to see vertical positions of artifacts and establish what may be present at the site. The team sieved excavated dirt through 1/8” sieves to recover artifacts. This allowed them to catch the tiny tools and the debitage, or tool-making waste. Darwent is happy about the team’s initial finds, which also included endblades (which were mounted on harpoon heads), harpoon heads, and a surprising amulet, a two-headed polar bear carved from ivory. Other findings included a pit containing burned blubber and other animal material and lots of dovekie bones. This indicates that Arctic peoples likely used Iita as a summer sea mammal hunting and processing camp, living in skin tents rather than in permanent structures. Back in the lab, Darwent is busy. Darwent hopes to expand the Iita excavation in 2014 or 2015 and says continued work at Iita is critical.